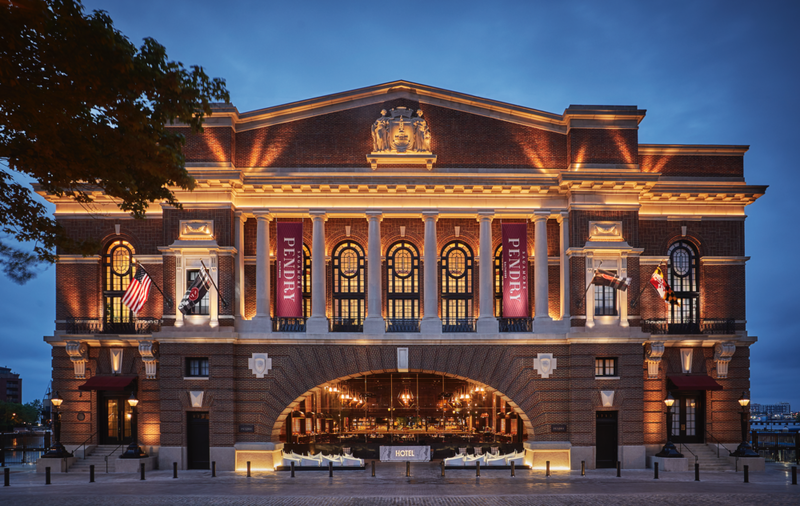 Sagamore Pendry is the brainchild of Sagamore Development, the Real Estate arm of Kevin Plank’s Under Armour. 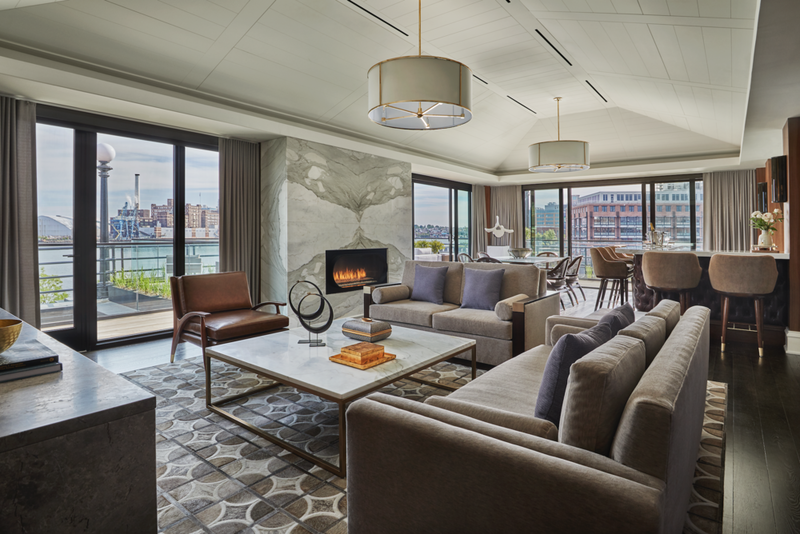 Sagamore partnered with the Operations team of Pendry Hotels to build a 128 room boutique hotel situated on a formerly dilapidated pier over the Baltimore Harbor. The original historic Beaux Arts building built in 1914, was a recreational facility and social meeting space for the pre-revolutionary neighborhood of Fells Point. Long since abandon, the building fell into disrepair and was in need of true vision to resurrect its grandeur and revive the energy it once provided the city. The project concept was driven by Kevin Plank as part of a larger plan to reclaim the vitality of the city. This project would become a physical expression of a larger renaissance in Baltimore. 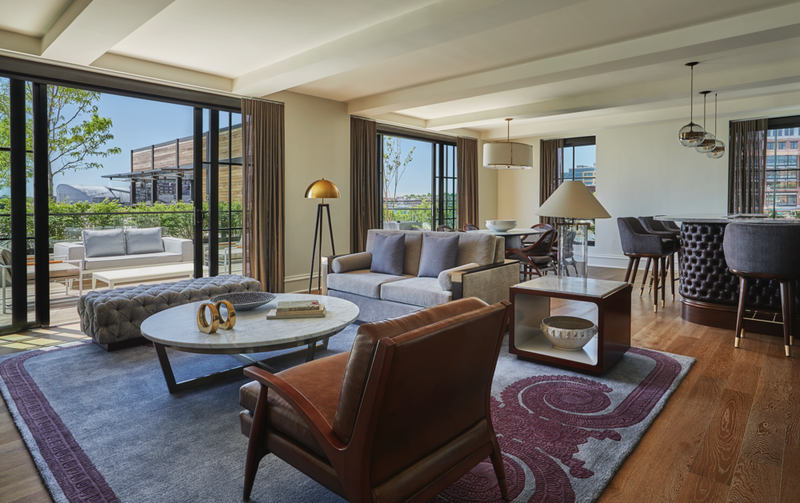 Plank and designer, Patrick Sutton’s, interest in storytelling and authenticity aligned with Pendry Hotel’s brand philosophy, “Know Thyself”, delivering location-centric boutique hotel experiences. 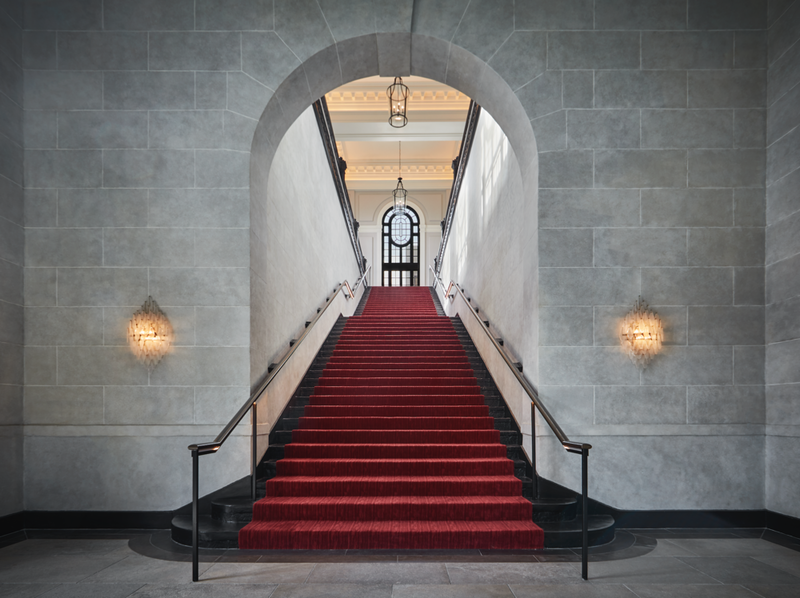 The overarching goal of the design was to deliver a world-class hotel fundamentally anchored in the charm and character of the historic waterfront neighborhood – an experience only existing in Baltimore. Patrick Sutton and his design team established the story underneath the project including rich layers from early American history, to the industrial growth of the city and its resulting wealth, to life on the waterfront, all the way to Baltimore’s horse-racing roots as part of the famed Triple Crown. Truly a genuine slice of Baltimore around every luxurious turn. One of the strongest stories is the history and the relationship, physically, to Fort McHenry, made famous in the Battle of 1812, where “The Star-Spangled Banner” was written. The idea was to find ways to tell that story through exploration. 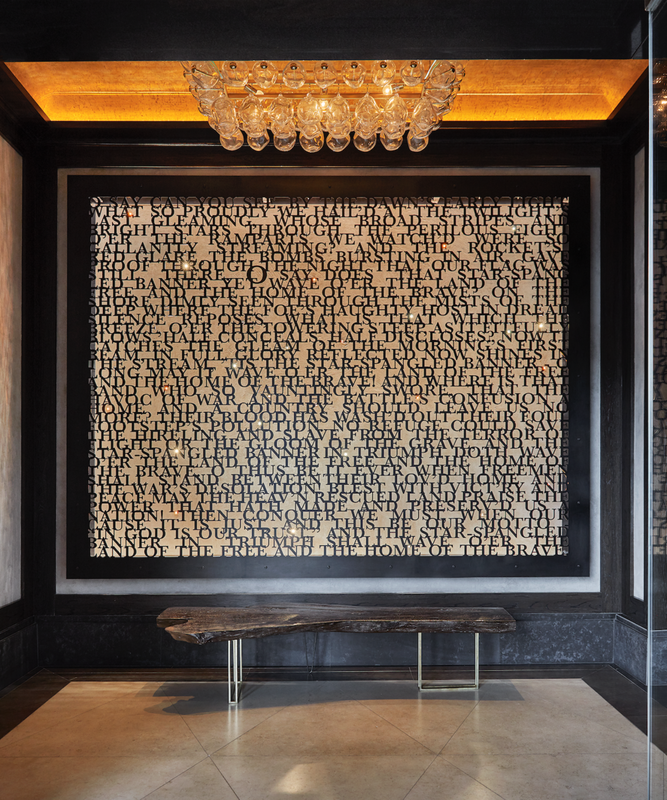 Therefore the first thing you see when you walk in the door is “The Star-Spangled Banner,” lyrics laser cut in steel as your first greeting to the hotel. 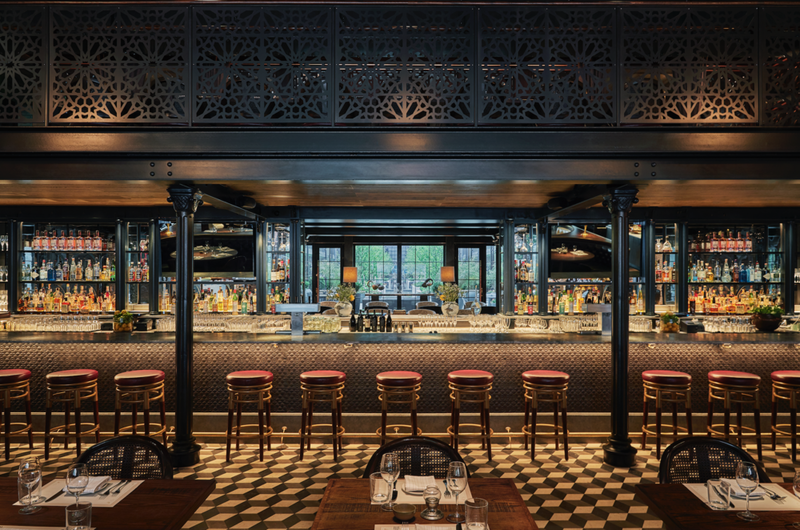 Guests can discover cannons unearthed during construction embedded in glass under the floor of the Whiskey Bar, aptly named The Cannon Room. Another pair flanks the Pool Deck pointing towards the legendary Fort McHenry as they would have been in 1812 under the “rocket’s red glare” and “bombs bursting in air”. 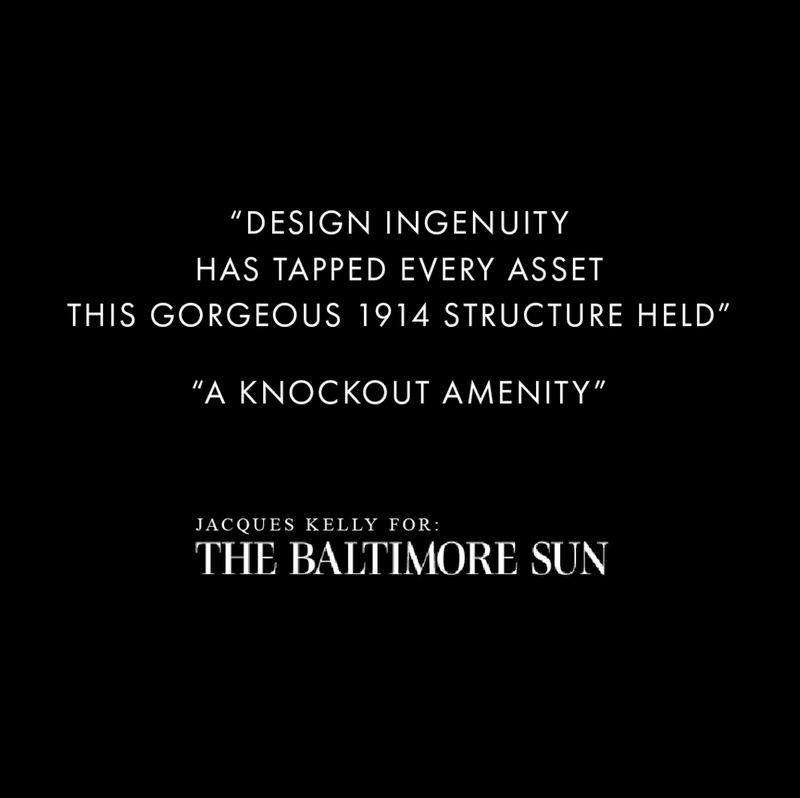 Baltimore is a city of industry, and it also become very wealthy because of that industry. The objective of the design team was to embrace that. 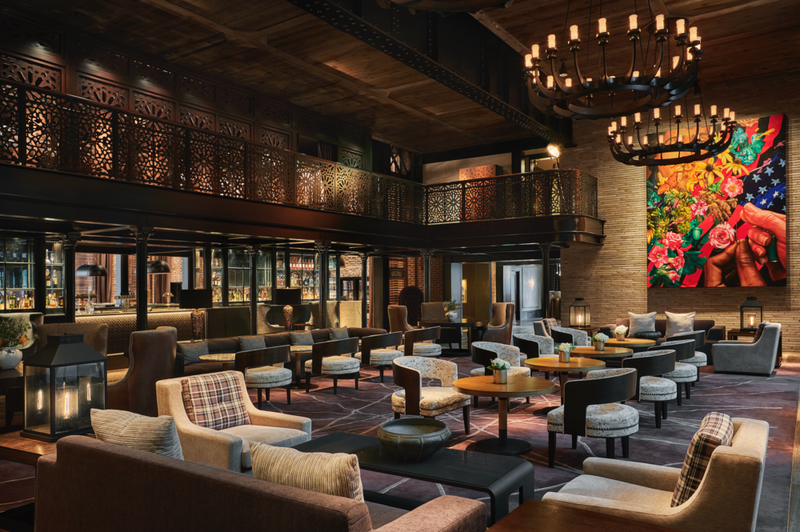 Throughout the hotel, there are exposed steel beams with rivets, juxtaposed right next to a beautiful leather sofa that’s supple and luxurious. Coupling those two elements is a representation of Baltimore. It is the charm of something that’s real, and industrial, made by men in work boots—right next to something luxurious and engaging and charming; and that was a goal for the hotel; engage that spirit of gritty luxury. 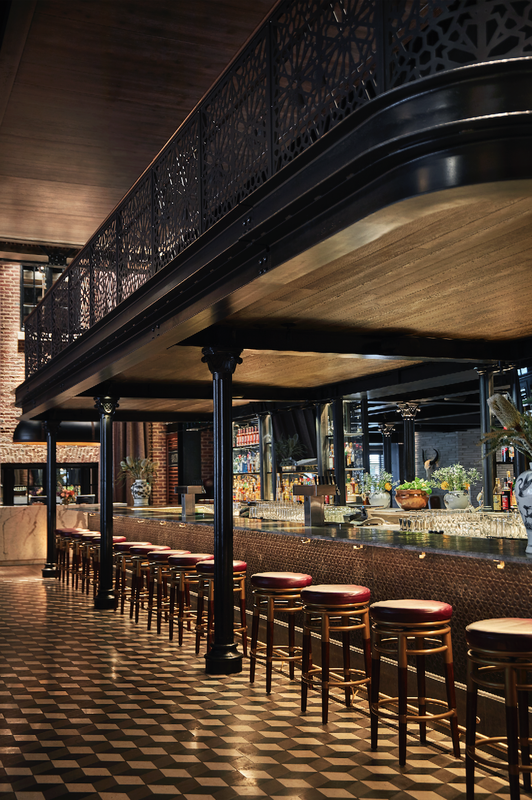 To enhance the feeling of unearthing all the Pendry has to offer, the design team encouraged guests to explore the hotel with a series of screens creating a sense of curiosity that make guests want to peek behind the veil and discover a new moment. A cut metal rail surrounding the mezzanine and catwalk above the restaurant and lounge peak guest’s interests to explore the level above. A central courtyard with an allee of trees punctuated by a massive Botero horse sculpture, pulls visitors in to stumble upon intimate seating arrangements gathered around outdoor fireplaces. 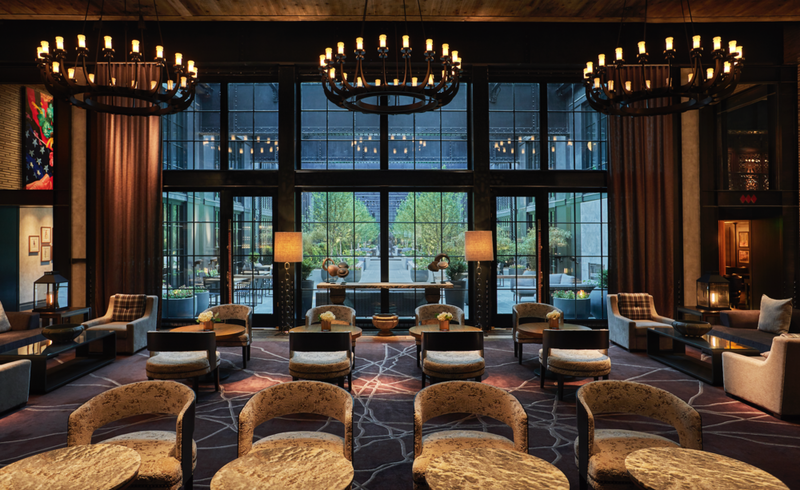 One of the most striking aspects of the Pendry also presented one of the biggest challenges in design and execution. The majority of the hotel is situated over the Harbor and surrounded on three sides by water. Not only did this present challenges during the build out phase that were carefully considered and planned for in the early stages, but it presented a design test to incorporate this essence of location while maintaining the strong aesthetic of the property’s design. This aspect of the hotel’s identity was largely incorporated into the guestrooms. 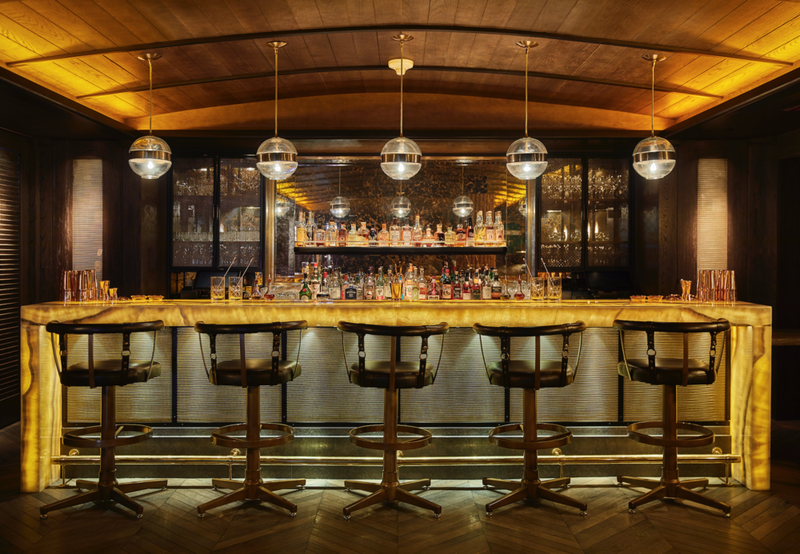 The team drew inspiration from nautical elements of brass, rich mahogany wood and area rugs inspired by a photograph of a rusted ship’s hull, designing the rooms to feel like a luxurious, modern and stately ship’s cabin. The design team was also able to thoughtfully marry the nautical elements with equestrian details to add another layer and to tell the story of Kevin Plank’s own Sagamore Racing and the storied past of horse racing in Maryland. Equestrian leather details and a plaque of the farm’s own thoroughbred racehorse, Native Dancer, hang in each elegant room balancing the nautical brass and warm wood tones. 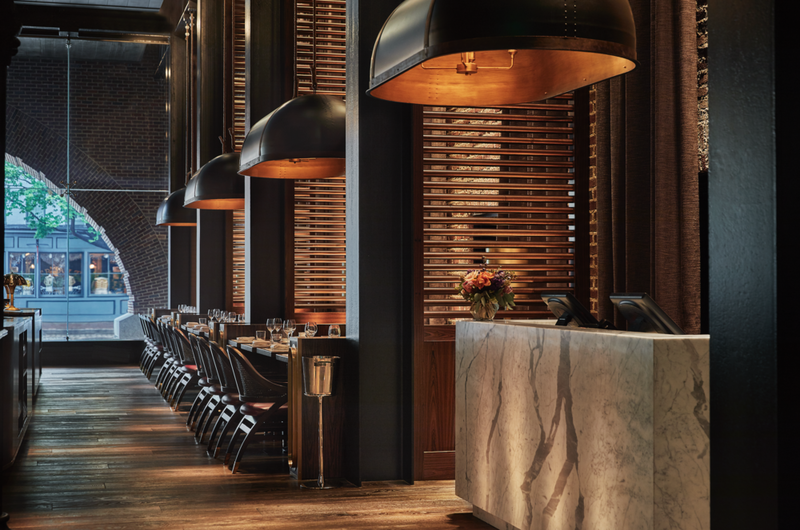 Sagamore Pendry set out to convey the idiosyncratic charm of Baltimore through the lens of a luxury hotel experience all while elevating the city as part of a larger Baltimore renaissance - and resoundingly delivered on all fronts.